Arrival Lombok – Transfers to Hotel : Arrival at Lombok Airport , or any others port in Lombok as Lembar/ Bangsal harbor, Teluk Kodek or maybe from any main object tourist among ( Mataram, Senggigi, Kuta lombok,3 (Gilis Trawangan, Meno, Air) and will pick up by our representative staff, then transfer to your hotel in Senaru where is the place you can meet with your trekking guide and porters then will briefing and explain the trekking procedure and prepare for your trips, Waterfall Sindang Gile and Tiu Kelep can be seen if you arrive min 1 hour min, before the sunset , Free at Leisure. Welcome Dinner with our staff Note : stay over night before the trek in Senggigi can be arrange on the request and then leave your hotel at 5.30 am. This programme is designed specially for real trekker (advanced). Participants must be at good level of fitness and have several mountain climbs experiences, its very challenge for every trekker and this trek start from Senaru village, ending in Sembalun village, lets do it with us. Type of trek : ( Fully organized (combination of adventure, leisure, safety ) Individual or group departures are available upon request. We will wake up at 02:30 am and usual time but, it the way for not missing the sun rise, and have a light breakfast. At 03:00 am start the trek for heading to the Rinjani summit (3672 m). Walking time about 3 hrs and 30 minutes. The 1st stage is a moderate climb for 2 hours, while the 2nd stage is a fairly easy but long trek. The last hour is very steep and difficult (there are many loose stones, and as you take two steps forward, you will slip one step back). 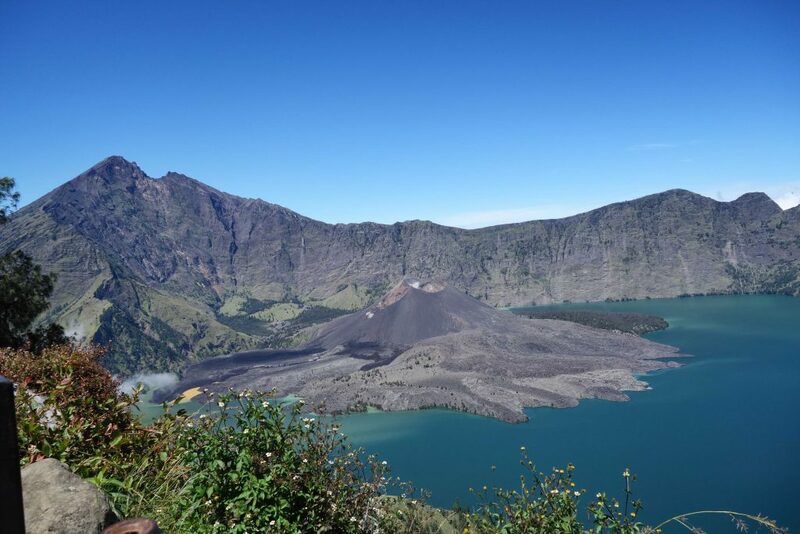 From the Summit of Mount Rinjani, you can see all of Lombok island, Bali, Mountain Tambora in Sumbawa and Segara Anak lake. After sunrise we will go down to the Sembalun crater rim and have breakfast. After breakfast and a rest, we will continue to go down to Sembalun village, walking time 4-5 hours, have some lunch on the pos 3 or 2 and will arrive in Sembalun village(1.150m) at noon time ,our car waiting here for bring us to Senaru village take your luggage and transfers to your next destination (Gilis,Senggigi or Mataram) end of service. • Full board meals; breakfast, lunch, dinner, supper for going to summit, coffee or tea, hot chocolate, snacks, fresh fruits,bread. • All camping equipment; double size camping tent, mattress, sleeping bags, dinning tent, portable toilet, etc.